Dry lands cover 65 per cent of the continent. One-third of this area is hyper-arid deserts and completely uninhabited, except in oases. The remaining two-thirds of the dry lands, which comprise arid and semi-arid lands, are home to about 400 million Africans. Africa also suffers from inherently low soil fertility as the bedrock consists of granites and gneiss. Most of the soils in Africa are characterised by a low proportion of clay, making them easy to work and also easy to lose. Every year, Africa loses about 280 million tonnes of cereal crops from about 105 million hectares of croplands. This can be prevented if soil erosion is curbed. Poverty-related agricultural practices are a major contributor to desertification. Continuous cultivation without adding supplements, overgrazing, lack of soil and water conservation structures, and indiscriminate bushfires aggravate the process of desertification. Africa is geologically very old. Nearly one-third of the central plateau of Africa is over 600 million years old (Pre-Cambrian age). The rest of the surface has sand and alluvial deposits of Pleistocene age (less than 2 million years old). Human activities in obtaining food, fibre, fuel and shelter have significantly altered the soil. Archaeological records claim that arid areas of Africa have been getting drier for almost 5,000 years. However, desertification is a coincidence of drought with the increasing pressures on fragile arid and semi-arid lands by greater number of people and livestock. This is accelerating land degradation. According to estimates, 319 million hectares of Africa are vulnerable to desertification due to sand movement. 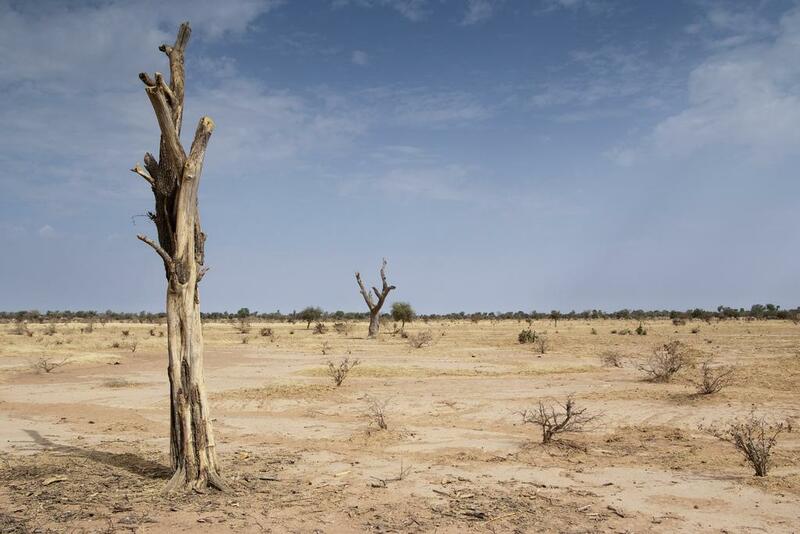 The assessment done by FAO and UNEP suggests that the desert is moving at an annual rate of 5 km in the semi-arid areas of West Africa. Desertification is happening at an estimated 20,000 hectares per. At least 70 per cent of Ethiopia is prone to desertification. While in Kenya, around 80 per cent of the land is threatened by desertification. Over 50 million people could move from the desertified areas of sub-Saharan Africa to North Africa and Europe by 2020. The Great Green Wall is a pan-African proposal to plant a wall of trees at the southern edge of the Sahara Desert to battle desertification. The strip of land from Dakar to Djibouti is 15 km (9 mi) wide and 7,100 km (4,400 mi) long. It's an initiative from African Union.